These opinions from a long-time TriMet family member are supported by the open letter to TriMet passengers drafted by the TriMet Road and Rail Supervisors and read aloud at the Pioneer Square rally by Jonathan Hunt, local President of the Amalgamated Transit Union (ATU). Hunt points out that fare inspectors are no longer allowed to give warnings to passengers who may have forgotten their passes or have tickets they failed to validate. According to Hunt, McFarlane’s policies not only include quotas for fare inspectors but also target the Yellow Line, with “an emphasis on the Albina/Mississippi and Killingsworth/Interstate stations” located in the part of Portland where there is the greatest concentration of people of color. (See ATU press release concerning the targeting of the Yellow Line here. )Hunt urges concerned citizens to sign a petition on the ATU website, here. Currently the TriMet Board is appointed by the governor. 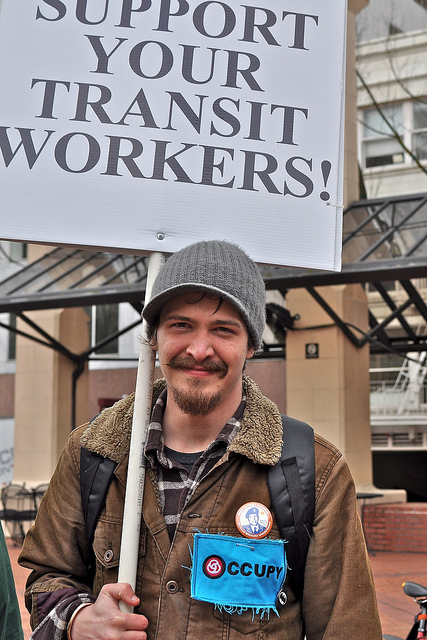 Other options proposed by union members and Occupiers would be a publicly-elected board, or TriMet could become a people’s cooperative, and the board could be filled by rotating the positions among those most concerned: drivers, riders, and citizens whose lives are affected by public transportation. 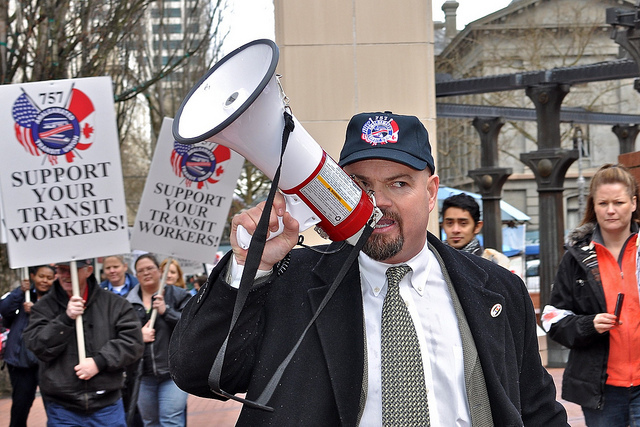 Jonathan Hunt, President of the Amalgamated Transit Union. Photo by Kendall. OPAL Environmental Justice Oregon believes that service cuts and fare increases will affect all of our community and is organizing a coalition of concerned community groups to protest TriMet policies. Portland has long had a reputation for being a progressive green city, but making public transportation more costly, and threatening the poor with unequal enforcement of proof of fares, is counter to everything we’ve been trying to do for the past thirty years. While trillions are being invested to keep car culture alive, those who do less damage to the environment are left fighting over budgetary scraps. I was sorry to have to leave Portland last August, and can only hope somehow, some day I’ll find my way back. I still care about what happens to the people there–a great community with lots of good-hearted folks. The buses are simply crucial to the life of the city, not at all a frill or “fat” and the article I just read makes me feel afraid for all of you. When something as basic as transportation becomes simply a cash cow–and one tainted by racism, as this appears to be–the entire city suffers as a result. If you had a mayor worth anything, maybe something could be done. Any hope there, or is he part of the problem? Come on back, Dan. We could use your energy. I don’t know what the Mayor is saying about TriMet. Since when did Occupy become about signing petions and educational campaigns? What happened to direct action? What happened to communicating to those in charge that the cost of instituting these austerity measures – ie public unrest – is higher than the cost of finding other ways to address budget problems – ie taxing the rich? We all know why the latter isn’t going to happen though, which is exactly why we should continue to push the issue. The State’s inability to respond leads it to a crisis point, a crisis of legitimacy, which in turn opens up all kinds of possibilities. Occupiers spent Wednesday riding the buses and streetcars, talking to people and spreading the word from dawn till dark. If you have ideas for more direct action, what’s holding you back? Come do it. You’re Occupy too. What’s holding me back is a lack of affinity with the people involved in these actions. Which I suspect is what’s holding most people back. This is just more activism. The difference between activism and resistance is one that Occupy Portland seems to be unable to grasp. Public transport should be for the public, not for profit, for the sake of the people and the environment, and provision – not enforcement – should be directed at those most in need. Good luck with the campaign! Here in the Languedoc new one-euro fares are being introduced to encourage people to use selected bus and train routes. I hope this will widen public transport use. very informative write up K! Following up the actions with education is wise and two fold and I think exactly what occupy should be doing as it remains in a trans formative state. I think it is evolving with these actions and targeting important issues…transportation is so vital to the workers and those without other means to get around too.